The Space Settlement Institute is a non-profit association founded to help promote the human colonization and settlement of outer space. Removal of regulatory, legal, and psychological barriers to private sector efforts in space. The Institute has identified "Lunar Land Claims RECOGNITION" - a law that would recognize the right of private lunar settlements to claim and resell the land around their base - as the necessary first step to incentivize permanent human habitation on the Moon. Land Claims Recognition is now in legal textbooks, and it is time to persuade Congress to enact the enabling legislation. 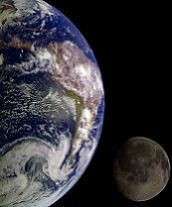 The U.S. government has decided not to go back to the Moon, philanthropists can't afford it, and there is nothing else on the Moon or in space profitable enough to convince private enterprise to pay to develop a reliable Earth-Moon transportation system and build a permanent lunar base. Passage of a Lunar Land Claims Recognition law is the only way we are ever going to see a return to the Moon, this time to stay. Why should humanity expand outward? And why now? Humanity's survival depends on moving out into the cosmos while the window of opportunity for doing so still exists. Besides helping to ensure the survival of humankind, the settling of space - including the establishment of permanent human settlements on the moon and Mars - will bring incalculable economic and social benefits to all nations. The settlement of space would benefit all of humanity. It would open a new frontier, provide resources and room for growth of the human race without despoiling the Earth, energize our society, and create a lifeboat so that humanity could survive even a planetwide catastrophe. Now is the time for the settling of space to leap from the pages of fiction to reality. It is now time to ignite what future historians will regard as the human species' greatest endeavor. If you like the Space Settlement Institute, please click the Facebook Like button. "I like this idea. It would create a broad constituency to do something, a cross-border would-be citizenry of the moon that I hope can spur governments and investors into action!" "I agree, ownership will be the only powerful driver to open our frontier." It's possible but not worth doing. I said it was a good idea all along. 350 West 42nd St, #51A, New York, NY 10036. All rights reserved. It has been days since the last person walked on the Moon.